Oh I've been looking for a calculator to be place on my fridge. It's handy when I need to resize my recipe. 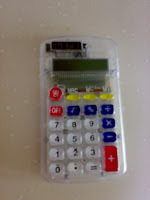 We're unable to find one which has magnet behind the calculator . Thus I've made this myself. 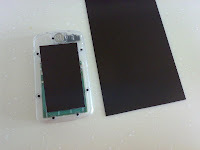 When to Daiso to purchase a calulator and a magnet. 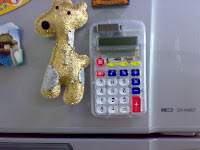 I glued them together and woila I've a fridge magnet calculator. Total cost of S$4. I found this useful household tips during today's spring cleaning. It was quite sometime ago as the printout was printed using dot matrix and on rolled paper with holes along the side for tearing. Use some tea leaves into a pair of stockings and stuff each into a shoe. Leave for a day or two and the odour will vanish! Use latex diswashing glove. They give a non-slip grip. Apply soap on the area - instant relief! They say ants never cross a chalk line. So draw a chalk line where the ants march-in. Break shells and drop into bottle. Add drops of detergent and bit of water, shake vigorously. Than rinse with water. Salty Soup. I put too much salt! Cut raw potatoes and throw them away onces they're cooked and have absorbed the salt. You've save the soup!